New technology in vehicle and machinery lighting has seen an incredible uptake of HID Work Lights and, to a lesser extent, LED worklights for vehicles and machinery. For the past five years, CW Imports has been importing HID Work Lights for farm machinery. Director Craig Gorfin explains that the use of HID Work Lights reduces eye fatigue and eye strain. Machinery operators agree with this view and comment that repairs and maintenance costs are down; and that productivity is up. This is because HID Work Lights have reduced time delays caused by impact breakdowns. The problem of flat batteries caused by overloaded alternators which are supporting too many halogen lights and power hungry auto steer systems is also eliminated. Summer spraying is a time-critical operation and many boom sprays run through the night. Night time spraying is one job where excellent lighting is essential. With many booms now out to 45 metres, standard halogen lights aren’t strong enough. 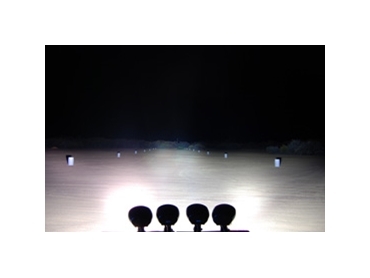 Quality lighting can be achieved by adding just four HID Work lights (two for forward vision and one on each boom). With their increased range of fully integrated HID Lights, Central Wheatbelt Imports has a light for all machines and vehicles.